UPDATE: All tickets for this have been claimed. A waiting list is available through Eventbrite. 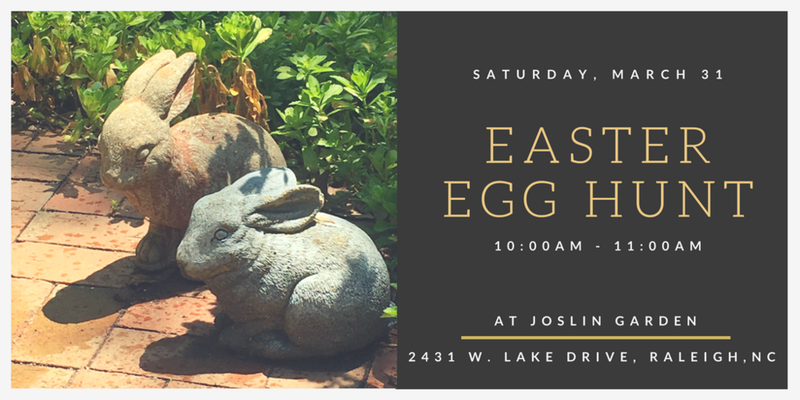 On the Saturday before Easter, March 31st children are invited to bring their Easter baskets and to come explore Joslin Garden and while parents visit beautiful Joslin Garden. Older children (six to ten) will go on a Nature Explorer scavenger hunt along the forest trails of the garden, looking for eggs that match their lists of local native species at 10:30AM. Both egg hunts are free and children will receive candy in the hidden eggs. Donations to help maintain Joslin Garden are accepted and appreciated. Please RSVP so that we can plan appropriately for the correct number of children. Older Post2018 Joslin Garden “Open Garden Days” Announced!